Heading to Vegas for the weekend? Planning a trip in the near future? Eater is here for you. This monthly guide covers the very best of Sin City, from the latest restaurant and bar openings to all things nightlife. Television personality Bobby Flay opened his first new restaurant in five years with Shark at the Palms. The seafood- and fish-forward restaurant features sushi and raw bar dishes. Many of the entrees are meant to share, such as a whole grilled lobster with basil, garlic, and red chili butter and The BF steak, a 36-ounce bone-in prime porterhouse with triple chili butter and pan juices. San Diego’s ¡Salud! Tacos!, a self-described “Chicano Food Eatery,” debuted its first out-of-state restaurant at Palace Station complete with tattoo-inspired murals, California and Baja, California-inspired tacos, and daily specials. Brass Fork Kitchen & Bar takes over the former Grand Cafe space at Palace Station. Each section of the menu brings traditional and twisted versions of dishes. At breakfast, that means standard omelets as well as versions with miso crab or chicken enchiladas. Eggs Benedicts, hashes, chicken fried steak, ham chops and eggs, pancakes, waffles, and French toast round out the morning. DJ’s Clam Shack has expanded to the Strip from Key West, Florida, serving a menu of “northern and southern seafood” specialties. Moving into the counter-service Boulevard Food Court and right next door to Fatburger, DJ’s has made itself easier to spot by parking a hot-rodded truck out on the patio. Launched on the East Coast in 2009, the Las Vegas expansion is open daily for lunch and dinner, featuring a menu highlighted by the $7 New England clam chowder, the $18 Maine lobster roll, a basket of Ipswich fried clams with fries priced at $29, and a $14 plate of garlic steamed middleneck clams. Diners can also order mahi mahi tacos, coconut shrimp, and a Key West favorite, conch fritters paired with fries or coleslaw. 7 Leaves Cafe, dubbed the Asian Starbucks, is now open at the Venetian, next door to the recently opened Halal Guys at the resort. A group of seven, four brothers and three friends, started the chain in Orange County’s Little Saigon in 2012. Now the company has grown to 16 locations in Southern California, along with one in Chinatown in Las Vegas and future locations in Houston. The company uses traditional Vietnamese methods such as stove top cooking and hand drip Vietnamese coffee phins. The compact menu specializes in teas, coffees, and 10 flavors of macarons. Beverage choices include oolong milk or strawberry hibiscus teas, sea cream black coffee or jasmine tea, Vietnamese coffee, and Japanese matcha soy. Fans of raw cookie dough can indulge at Doughp, now open at the Miracle Mile Shops. The San Francisco-based dessert bar from Kelsey Witherow features flavors such as This S’more is Hella Lit with cookie dough with graham cracker pieces, marshmallows, chocolate chips, and a chocolate drizzle; Cinnamood with snickerdoodle cookie dough with white chocolate chips; Cookie Monsta with blue cookie dough with Oreo; and a special Vegas flavor Vegas Blackout with black chocolate chip cookie dough with gold sprinkles, inspired by the Vegas Golden Knights NHL team. Diners can choose from one to three scoops of dough and then add chocolate chips, sprinkles, childhood cereals, peanut butter, or even chocolate sauce from a three-tier chocolate fountain. Side Piece Pizza Restaurant lands at The Palms on March 18. The pizza joint will serve New York- and Sicilian-style pies and slices near the casino-facing entrance. Chef Enzo Esposito, who hails from Naples, Italy, heads up the kitchen. The pizzaiolo brings a menu featuring classic cheese, pepperoni, vegetable, sausage, and meatball, as well as a traditional white pizzas. Side Piece will also offer a selection of beer and wine in a can to pair with its pizzas. The Palms has a super-secret supper club with the debut of Michael Symon’s Sara’s. Symon entered the Las Vegas dining scene last December with Mabel’s BBQ, but now he spreads his wings a bit more with a secret “meateasy” supper club tucked inside the restaurant. Sara’s sits inside a room within Mabel’s BBQ that brings back the heyday of old Las Vegas with a menu of French-American dishes, many served table side. The menu features escargot casino, prime beef carpaccio, and smoked beef bones with horseradish. Entrees include a smoked prime rib with au jus and horseradish shaved table side, truffle fried chicken with honey, and Dover sole meunière. For dessert, classics such as bananas Foster and cherries jubilee. Late at night, Symon serves a double cheeseburger with bone marrow, a shot of Dickel Rye, and a Miller High Life. Eataly introduced a sit-down restaurant called Manzo. 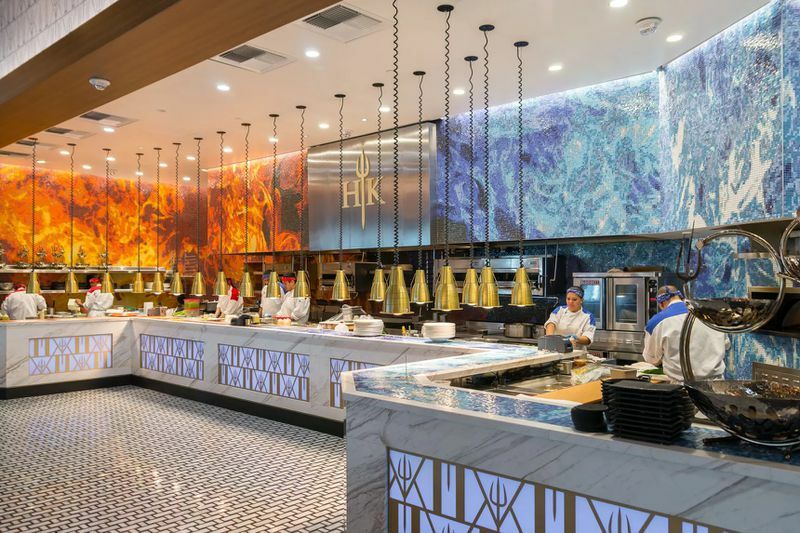 The ode to all things meat sits on the Park MGM casino side of the 40,000-square-foot Italian marketplace, near Gran Caffè Milano. Eataly executive chef Nicole Brisson and Manzo executive chef Arnold Corpuz created the menu that includes a 42-ounce rib-eye appesa, a signature dish that uses Creekstone Farms beef suspended over a three-tiered grill for 45 minutes, slow-roasted, and reverse-seared. Meet the newest luxury cocktail lounge at the Palms: Mr. Coco, located in the Fantasy Tower of the Palms. Guests who take the elevator up to the third floor can order cocktails and bites while enjoying art and live entertainment. Chef Steve Benjamin, who left L’Atelier de Joël Robuchon at the MGM Grand in 2017, and currently oversees the food and beverage at the Waldorf Astoria in Los Angeles, created the menu that includes caviar served table side. Bites include gruyere cheese puffs, hamachi and salmon with crispy rice, and smoked salmon on a baguette with dill. Find Vietnamese street food at the Palace Station’s Mumfresh Asian Eats, which serves up healthy spins on a fast-casual menu prepared in “the style of cooking that originates from our Mum’s kitchen.” On the menu, a range of pho soups, vermicelli noodle, and rice bowls, plus teriyaki bowls created with chicken, beef, or tofu. It seems that Gordon Ramsay’s Hell’s Kitchen restaurant is the height of Vegas dining right now, with people dressing up to the nines and waiting in line to eat at this real life version of the TV cooking competition show. The food consists mostly of Ramsay’s classics, like a very good, if slightly boring, beef Wellington, as well as some nicely seared scallops with lardons. The cocktails aren’t bad either, especially the Smoke on the Boulevard, a negroni variant that comes with a bit of a show. Kogi chef Roy Choi has finally opened Best Friend, his ode to LA’s Koreatown at the Park MGM resort. The menu certainly has a lot of similarities to the excellent but sadly short lived POT at the Line Hotel, with everything from Korean banchan and chicken wings to kimchi fried rice and barbecue. Choi’s even brought over some LA classics like Chego’s pork belly rice bowl and POT’s uni dynamite rice. Since this is Vegas, Best Friend takes Choi’s ambitions a little bit farther than what he was able to do in LA’s Koreatown, and so far it seems like a fine addition the Strip’s ever-changing restaurant scene. 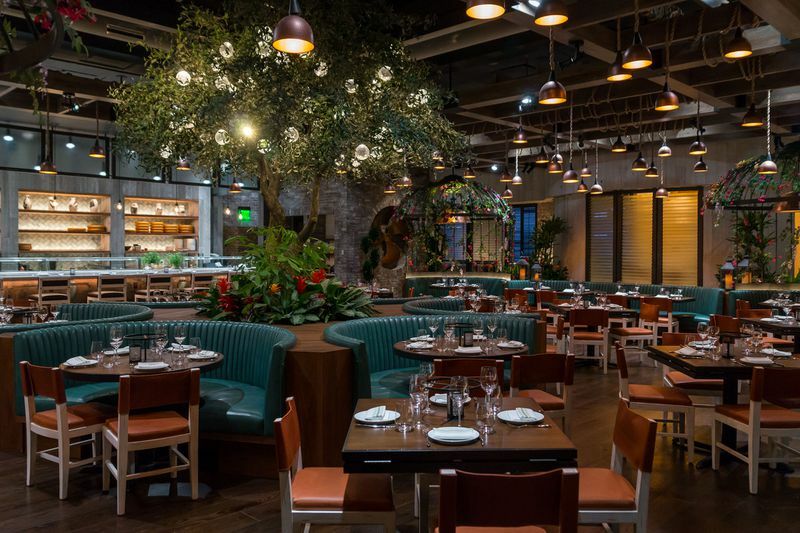 Another notable LA restaurant, this time the pasta focused Italian restaurant Factory Kitchen from Valentino vet Angelo Auriana, has opened at the former B&B Ristorante space after Mario Batali’s misconduct scandal resulted in the closure of restaurant he was affiliated with in Vegas. The 152 seat restaurant is yet another chapter from LA opening on the Vegas strip, cementing to the two big dining scenes with another thread. On the Record, a new club and nightlife concept from LA’s Houston Brothers, has also opened at the Park MGM, and they’re starting out their operation with a slew of guest bartenders at its speakeasy, which is called Vinyl Parlor. Notable bartenders include Jillian Vose from NYC’s Dead Rabbit, Alex Day and David Kaplan from Death & Co., and Jim Meehan from PDT. The place clearly has taken cues from Koreatown’s Breakroom 86. 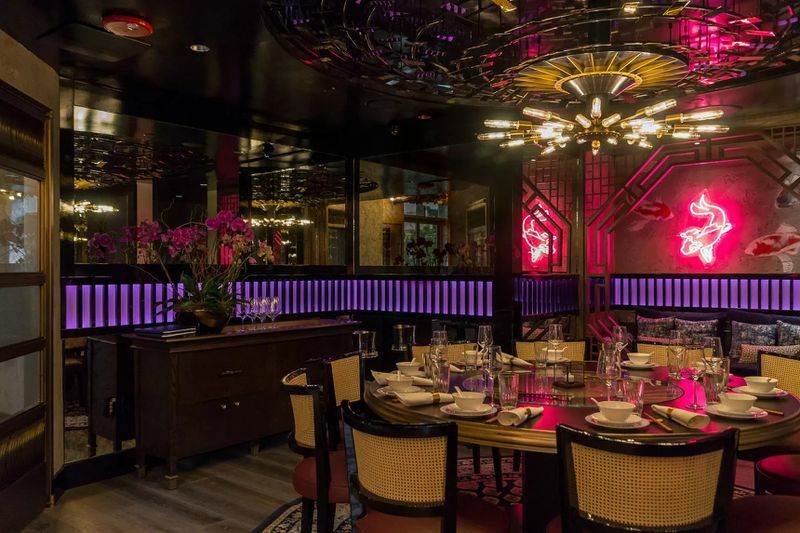 The Palazzo has a new Chinese eatery called Mott 32, taken from NYC’s famed Mott Street. Crispy Peking duck, apple roasted duck, and lobster har gow highlight a menu that should appeal to Asian gamers and locals looking for a more upscale Cantonese experience. Eataly, which also opened in Century City last year, has debuted a 24/7 location at the front part of Park MGM with a massive 40,000 square foot space that six different counters, a marketplace, and a cafe that serves food all day and throughout the night. Aria’s new standout restaurant comes by way of New York City, though Catch has certainly developed roots in West Hollywood as a celebrity magnet. The sceney spot boasts a similarly arresting entrance studded with greenery, leading to a wide open dining room that packs in a ton of energy. The menu uses perhaps a bit too much truffle oil, and leans heavily on the Nobu formula of dainty sashimi platters covered in ponzu and other toppings. Still, the service is excellent and professional, while the wine list surprises with some choice bottles. Cocktails veer toward the overly sweet, so stick to something more spirit forward like the Meatpacking Manhattan. The hot dishes are good crowd pleasers though, like the crispy shrimp, herb-roasted branzino, and mushroom spaghetti, the latter of which helps fill the stomach after those slender raw fish courses. 3730 S Las Vegas Blvd, Las Vegas. 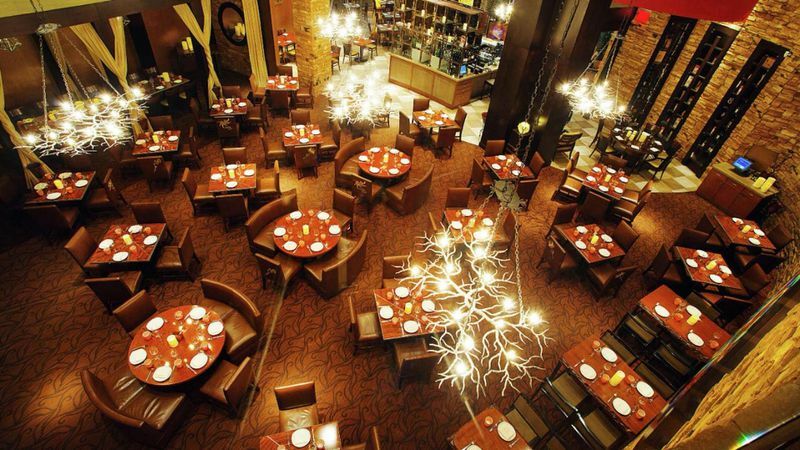 It’s Eater Awards season, and Eater Vegas has the latest set of winners from this past year. The big Restaurant of the Year award goes to NoMad Bar, the more casual and every day part of the new NoMad Hotel at the Park MGM resort. Here’s what Eater Vegas editor Susan Stapleton had to say about the the NoMad Bar: “The restaurant’s menu offers a lesson in perfection. From the carrot tartare and black truffle tart to the hot and cold oysters and mixed fry, diners here will find a playful yet carefully executed menu that only exhibits why the sister bar in New York earned a Michelin star.” Kudos. Other winners include Scott Conant for Chef of the Year for his new Masso Osteria at Red Rock Resert; Gordon Ramsay Hell’s Kitchen for Design of the Year (the place does look pretty over the top, in a good way); and Scotch 80 Prime for Off Strip restaurant of the year. And Palazzo bar Rosina get Bar of the Year for its Art Deco interior and decadent twists on classic drinks. Steak is king in Vegas because there’s no grander way to dine in America’s playground. Eater Vegas has a super helpful guide this week on what to order at every major steakhouse in town, from the filet mignon and baked potato at the iconic Golden Steer to the peppercorn-crusted New York strip at Prime Steakhouse at the Bellagio. Despite an action-packed fall season, winter looks promising too in the openings department in Vegas. NYC’s Sadelle’s should open by late December inside the Bellagio, Eataly is poised to transform the front of the Park MGM with a 24/7 marketplace and food emporium, and Roy Choi’s Best Friend is just a few weeks from its debut at the Park MGM. One might argue that Nobu Matsuhisa’s unique brand of understated clubstaurant gets the most respect in its genre, and for good reason. The dishes employ pristine seafood and come prepared with a high level execution. The flavors are innovative, playful, and light enough to power someone through dinner and leave enough in the tank to hit the nightclub after. But more than anything, Nobu is its own kind of club, a place with electro tunes, dim lighting, suave servers, and cold sake. 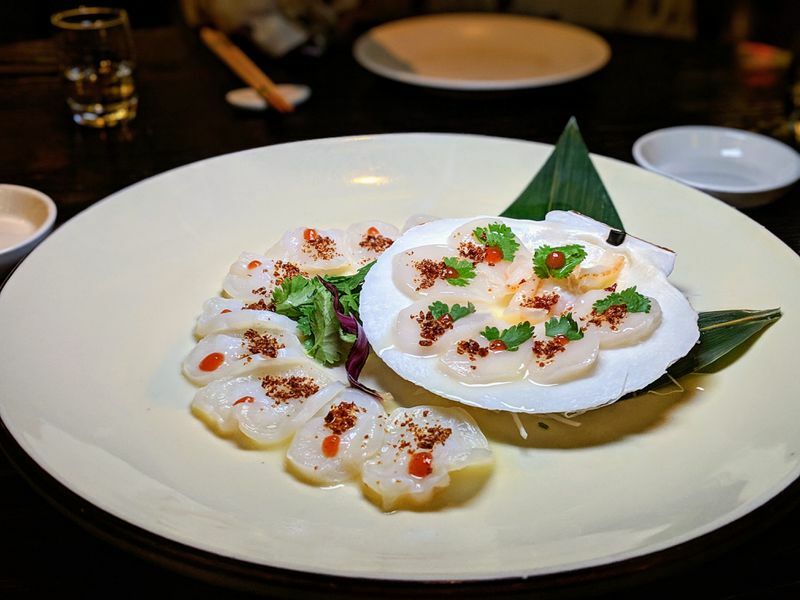 The Nobu brand is a bit of stretch from the Japanese chef’s La Cienega Boulevard restaurant, Matsuhisa, but the food is virtually identical between the chain and the one-off original, which says a lot about the marketability of the fare. The classics definitely live up to the hype, like the silky, comforting miso black cod, though the delicious but traditionally-minded scallop tobanyaki seemed more grounded in Japanese home cooking than anything (black truffles were probably unnecessary). Even the nigiri is pretty solid, arrayed on a beautiful platter and boasting high quality cuts, though rice would’ve benefited from a bit more seasoning. Nobu does an excellent job of hitting the mark for aspirational diners: ambience, quality, and scene, but it doesn’t fail in the deliciousness department either. 3570 Las Vegas Boulevard S. Caesars Palace Las Vegas. The NoMad at Park MGM is now open and it must be one of the most striking new dining rooms on the Strip. With high ceilings, thousands of real vintage books, and luxurious appointments everywhere, it actually manages to one up LA’s own NoMad restaurant in the look department, reflecting a bit more of the New York City establishment’s Manhattan original. Opened just last week on November 14, it’s sure to become one of Vegas’s new hit restaurants. Restaurateur and pizzaiolo Marc Vetri of Philadelphia has debuted an Italian fine dining restaurant called Vetri Cucina at the top of the Palms Resort where Alizé once stood. Occupying the 56th story and boasting pretty incredible views of the Vegas Strip, the menu has a hefty dose of upscaled Italian classics that should please a crowd. And there’s a colorful pop art experience when diners depart the restaurant in a hidden stairwell. Beloved Downtown restaurant Eat, which serves excellent breakfast and lunch, comes from Natalie Young, who will open a second restaurant called Old Soul at the World Market Center. There’s no projected opening date right now, but it goes into the former Mundo, a Latin restaurant that occupied over 5,000 square feet. Off-Strip locations continue to be Vegas’s better dining destinations, and two big culinary heavyweights in Colin Fukunaga (Fukuburger) and Marc Marrone (Tao Group) plan a rooftop restaurant in Downtown. It should be a hit with locals wanting to avoid the tourist-heavy Strip. Angelenos know Wolfgang Puck’s Spago well, but the Beverly Hills original doesn’t have what the newer Vegas location can boast: pristine views of the Bellagio fountains. 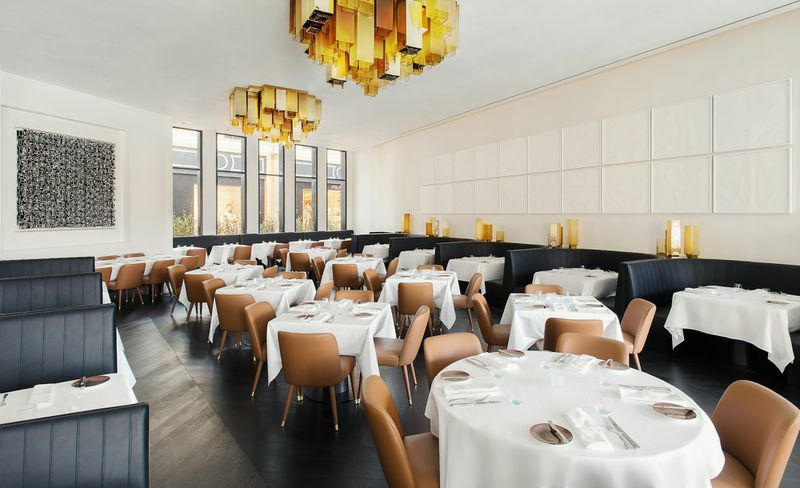 With better winter weather allowing for daytime dining on the patio, Spago’s lunch menu is the ideal place to order classic dishes like the truffle-topped spaghettini or the smoked salmon laced with salmon roe (or Kaluga caviar depending on how well one did at the tables). Lunch here is an exercise in nostalgia for anyone pining for Chinois chicken salad or Puck’s classic veal wienerschnizel. Dinner is a bit more ambitious, reflecting more of the Beverly Hills Spago’s menu of three distinct courses, though selections have a wider appeal with entrees like roasted lamb rack and wagyu beef. Still, Spago’s Bellagio location maintains that minimalist California cool but with the bombast and style of the Vegas Strip. Honestly, it’s a much better location than its former digs at Caesar’s Forum Shops. 3600 Las Vegas Blvd S	Las Vegas. Cipriani’s classy new Vegas location opens at Wynn Plaza this weekend (see the glorious photos on Eater Vegas here) with a rather handy set of Italian classics. Founder Giuseppe Cipriani Sr. first opened the iconic Harry’s Bar in Venice in 1931 where he invented the Bellini. Not a bad pedigree. Anyway, this Vegas location does a nice job of blending the wood-paneled New York locations of the chainlet with ritzy blue hues and an open layout that lends to people-watching. The room feels like a really nice yacht, which feels appropriate for the Wynn. Famous dishes to order include the carpaccio, baked tagliolini with ham, and vanilla meringue dessert. Anyone hankering for those dishes can also find a few Cipriani classics in Beverly Hills’ Mr. C hotel. Need a quick rundown of the biggest upcoming Vegas restaurants? Here’s a list that compiles them nicely, and the highlights this season are Mabel’s BBQ from Food Network personality Michael Simon, NoMad restaurant (which opens November 14), and LA’s own Factory Kitchen (coming in December). Other LA transplants include Roy Choi’s Best Friend and the Houston Brothers’ On the Record, both debuting inside the newish Park MGM resort. Any fans of Philly’s Marc Vetri will have a chance to try his amazing pizza and pasta beginning November 19. The new Eater Vegas heatmap highlights Lakers legend Shaquille O’Neal’s Big Chicken, with sliders, chicken strips, and mac & cheese to a Strip-adjacent location next the Hard Rock Hotel along Paradise Road. Remember that Shaq’s also planning to open a restaurant next to Staples Center, his former NBA dunking grounds. One of the rarest experiences in all of America, the Clubhouse at Montecristo is a private dining room fully served by the next door Old Homstead deep inside Caesar’s Palace, and it’s fully legal to smoke cigars while enjoying an array of steaks, salads, and sides. 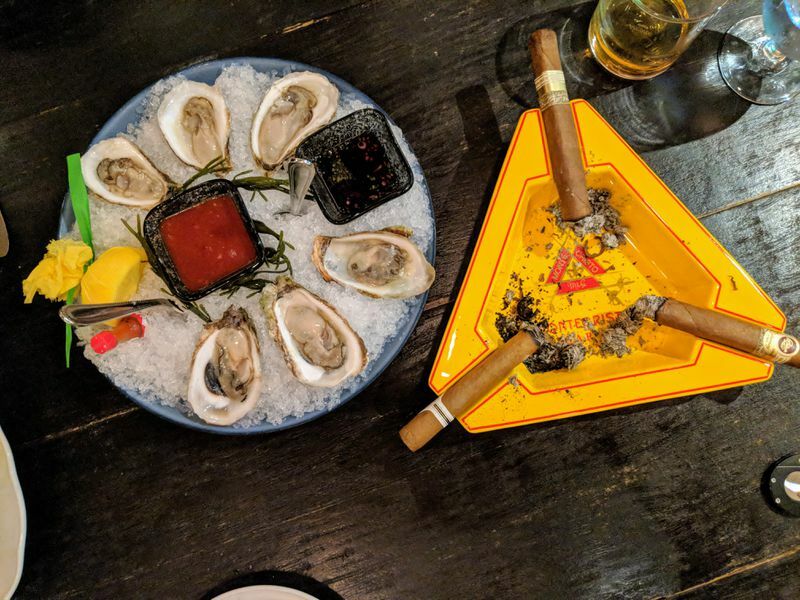 The place requires a reservation, and most nights they only serve one party, but it’s truly amazing to be able to slurp up oysters, cut into dry-aged steak dinner, sip cocktails or high-end spirits, and dive into chocolate cake while finishing the meal with one of the bar’s numerous cigars. There’s even a television, making it a nice place to spend an evening with buddies watching sports. There is a hefty minimum spend, which means the bigger the crew, the easier it is to try this truly unique restaurant-within-a-bar. Caesar’s Palace, 3570 S. Las Vegas Boulevard. 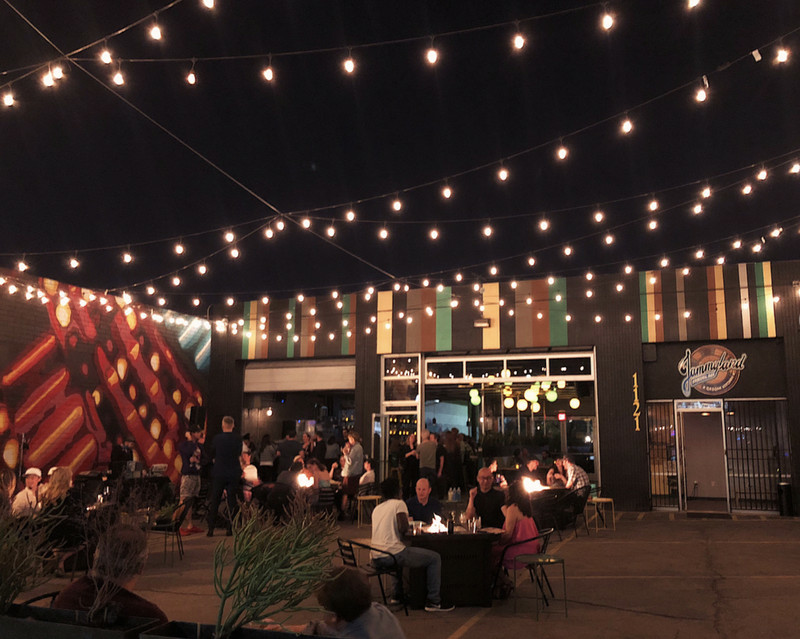 LA bar veterans Danielle Crouch and Allan Katz, who used to helm Caña Rum Bar in Downtown LA, have brought their talents to Sin City with a fun Jamaican-inspired restaurant called Jammyland in Vegas’s Arts District. The drinks here are as good as they were at Caña: creative, balanced, and truly delicious. Try the Brazilian Necktie, a take on the Gordon’s cup made with chile-infused cachaca, lime, cucumber, and smoked sea salt. The duo also set up the bar menu at Here’s Looking at You, and since that restaurant has about as close a rendition to the historic Mai Tai as one can get in LA, they’ve brought the approach over to Vegas. The price tag isn’t as hefty here, and this one blends Appleton rum, Rhum Clement, curacao, and house-produced orgeat. After imbibing, try the excellent smoked jerk chicken wings or beef patties. 1121 S. Main Street, Las Vegas. The big news this week was NoMad Bar’s reveal inside the Park MGM resort (actually it’ll go into the NoMad hotel, which is the top few floors of the Park MGM). The classy drinking establishment from the same team behind LA’s NoMad boasts a dark lounge, grand piano, and bites from Daniel Humm. Barman Leo Robitschek assembles the cocktail menu here, which could become one of the better places to drink in Vegas once it opens. Food Network personality Michael Symon teases some photos of his upcoming Mabel’s BBQ, set to open inside the Palms just off the casino floor later this year. The huge space will have an outdoor patio too, which should come in handy during the cooler fall and winter months. LA nightlife impresarios Jonnie and Mark Houston show off a bit of their upcoming nightclub On the Record, which goes into the Park MGM’s ground floor. There’s elements of many of their LA spots, from Good Times at Davey Wayne’s and Dirty Laundry to K-Town’s Breakroom 86, including three karaoke rooms. The place opens just before the New Year on December 28. MB Steak at the Hard Rock Hotel has a crazy 16-pound Tomahawk steak served tableside that costs $1,200. It should feed up to 12 people and it comes with a ton of shareable sides like lobster mac & cheese. It needs to be ordered 72 hours in advance, so plan this one on an upcoming trip. 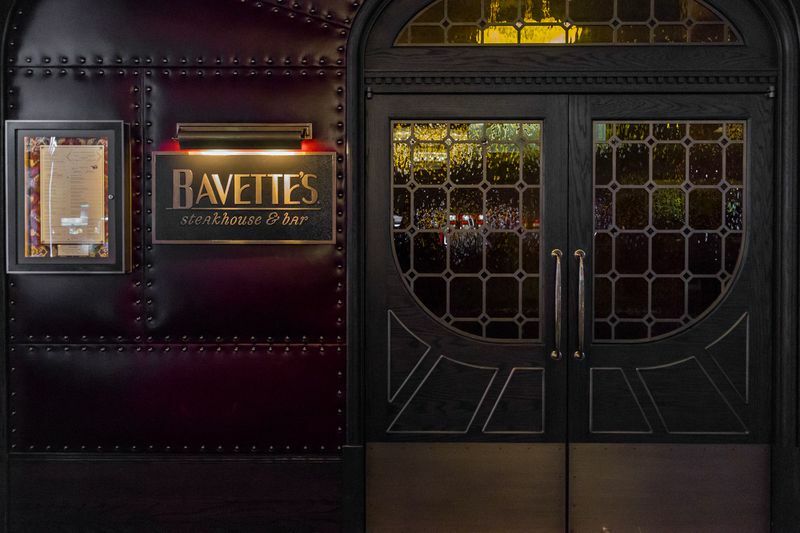 Vegas is really into secrets, so here’s ten secret restaurants and bars to find in the city, from the speakeasy the Mob Museum to exclusive Paiza Club at the Venetian. This Chicago transplant goes into the Park MGM hotel bringing much of its dark Windy City vibe deep inside this newly remodeled resort. It’s been open only a year, but it’s already one of Vegas’s best steakhouses thanks to a fairly straightforward approach of quality and good service. The interior is striking and original, with a meandering hallway that opens up to a lounge area before revealing a huge dining room chock full of details. The room looks a lot better than its Chicago original, which has more of that Boardwalk Empire vibe. Here in Sin City, it’s more ritzy and plush, with jazzy music, colorful artwork, and sturdy leather chairs. Start with an elegantly stirred Bijou cocktail and share the plump shrimp de longhe, mopping up the tangy garlic herb sauce on the bottom. The steaks are fantastic, broiled dry-aged prime cuts plus fine dining-level side dishes. The dry-aged bone-in ribeye is the way to go, large enough to split. 3770 S Las Vegas Blvd, Las Vegas. “Las Vegas Weekend Guide for Angelenos, April 2019.” Eater LA – All. https://la.eater.com/2018/9/28/17914684/las-vegas-weekend-guide-fall-winter-2019.